September 23, 2016 Victoria, BC – The Victoria Royals were stymied by goaltender Ty Edmonds and the Prince George Cougars on Friday night as they fell by a score of 3-1 to open their 2016-17 WHL Regular Season. The Royals fired 31 shots in the contest, but could only beat Edmonds once as the 20-year-old netminder was the game’s first star with 30 saves. Prince George’s Colby McAuley tallied a pair of markers including the game-winner in the opening frame and an empty net goal in the third period. The Cougars’ other tally was recorded by Max Martin to open the game’s scoring. Victoria’s Ty Westgard registered his first career WHL goal in the middle frame when he deflected a shot from the point. Royals’ goaltender Griffen Outhouse made 17 saves on the 19 shots he faced. Neither team could find the back of the net on the man-advantage. Victoria held a mark of 0/9=0.0%, while the Cougars went 0/4=0.0%. The Royals will continue their four-game homestand tomorrow night against the Prince George Cougars with puck drop set for 7:05 p.m. Tomorrow’s contest will see Victoria honour Canadian athletes who participated at the 2016 Summer Olympic Games in Rio de Janerio, Brazil. Show your true blue by joining the Royals’ family. Ticket packages start from as low as $80 and include great benefits such as exclusive gifts, early entrance, newsletters and rain check nights for unused tickets. 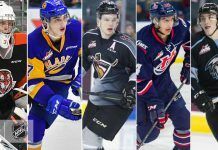 Get the full details by calling 250-220-7889 or by visiting www.victoriaroyals.com.